Anesthesia system also known as anesthesia workstation consists of the ‘anesthesia machine’, ventilator and breathing system. Others are scavenging system and monitors. Further to these, you may add drug delivery system, suction machine and data management system. Anesthesia machines comes in variety of shapes and sizes. Anesthetic machine use and working principles is the same with different machines. However, added features from manufacturers separate between each type. Apart from this, parts may differ by shape and size but still call by the same name. For example, Vapourizer. 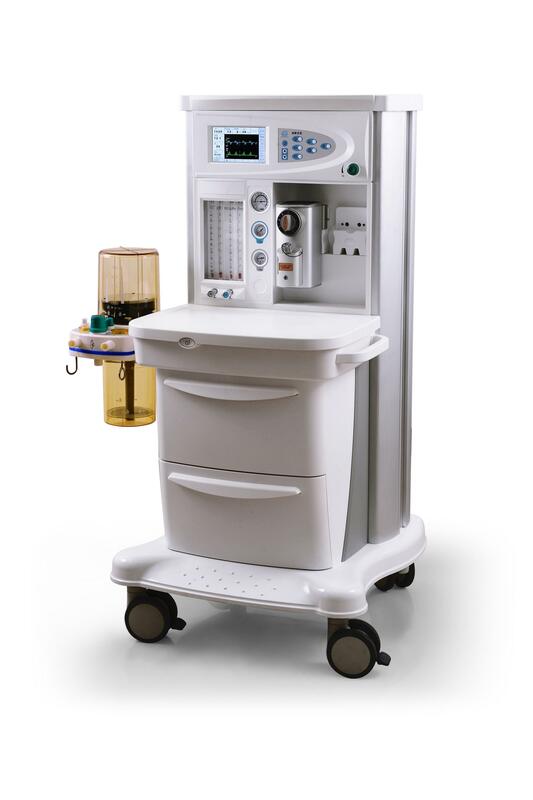 check vaporizer for Boyle’s anesthetic machine which is different from draeger. Because of danger of electrostatic discharge, body of anesthetic machine and accessories are produced with anti static material. Anesthetic machine parts include but not limited to the following: Rotameters or flow meters, vaporizing bottles also known as vaporizer and oxygen gas. Others are anesthetic vapor, nitrogen supply, carbon dioxide supply and breathing circuit accessories. Further are oxygen flush, cylinder yokes, soda lime canister, sensors and gas regulators. The anesthesia ventilator uses a pneumatically-operated electronic control mode, a 10.1-inch color LCD display that monitors various breathing parameters. It is suitable for the medical department to perform circulatory tightness, semi-closed, semi-open inhalation anesthesia, controlled or assisted breathing, and monitoring and display of patient’s ventilation parameters. High precision evaporator with precise concentration control. Advanced temperature, flow and pressure compensation techniques are used.There are various evaporators such as enflurane, isoflurane, and sevoflurane. The integrated anesthesia breathing system (external respiration circulation circuit) has good sealing performance, convenient operation, beautiful appearance, easy cleaning and disinfection, and can withstand high temperature of 134°C. (According to the needs of users, optional buried sensor integrated anesthesia breathing system and loop heating system). Previous PostSolar panels installation for homesNext PostHow to Make Remote Control Light Switch?